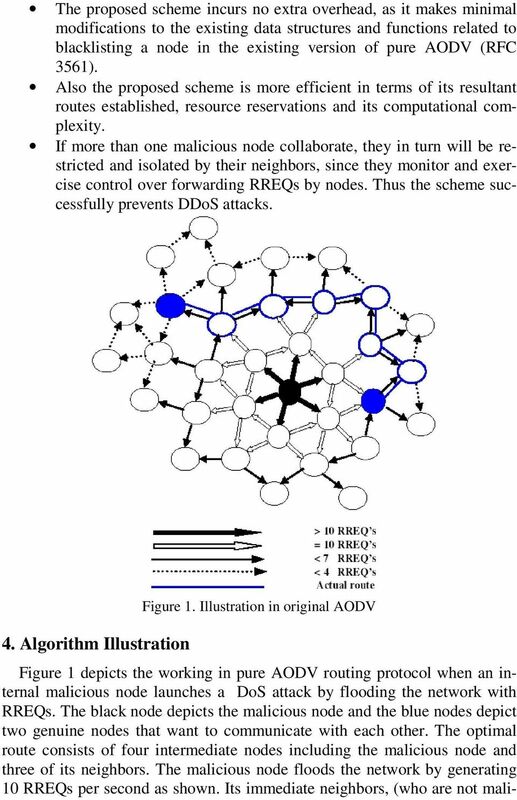 Download "Security Scheme for Distributed DoS in Mobile Ad Hoc Networks"
6 addition to limiting the clogging up of resources in the network, the proposed scheme also, isolates the malicious node. The route established in this scheme is expected to be the optimum route, which consists of minimum number of intermediate nodes. Thus, no DoS attack is experienced in the developed scheme. 5. Simulation/Experiments and Analysis NS-2 simulator is used  for the implementation of the proposed scheme. The IEEE  protocol is used for the MAC layer. The AODV protocol incorporated in NS-2 by Uppsala University, Sweden, was used as the base protocol. Modifications were made to this version of AODV protocol that confirms to RFC TCP was used as the transport protocol Radio transmission range is set as 250 meters. Traffic sources used are Constant-Bit-Rate (CBR) and the field configuration is 2000 x 2000m with 69 nodes Traffic Scenario Node 0 is configured as the malicious node. It starts flooding the network with fake RREQ s at simulated time of one sec till time 17 secs. The traffic was generated such that the source and destination pairs are randomly spread over the entire network. The other source-destination pairs are shown in Table 1. Table 1. 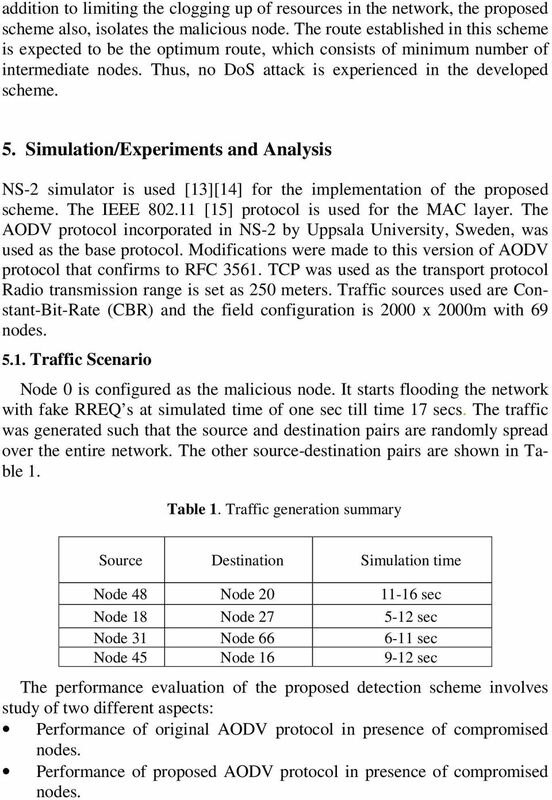 Traffic generation summary Source Destination Simulation time Node 48 Node sec Node 18 Node sec Node 31 Node sec Node 45 Node sec The performance evaluation of the proposed detection scheme involves study of two different aspects: Performance of original AODV protocol in presence of compromised nodes. 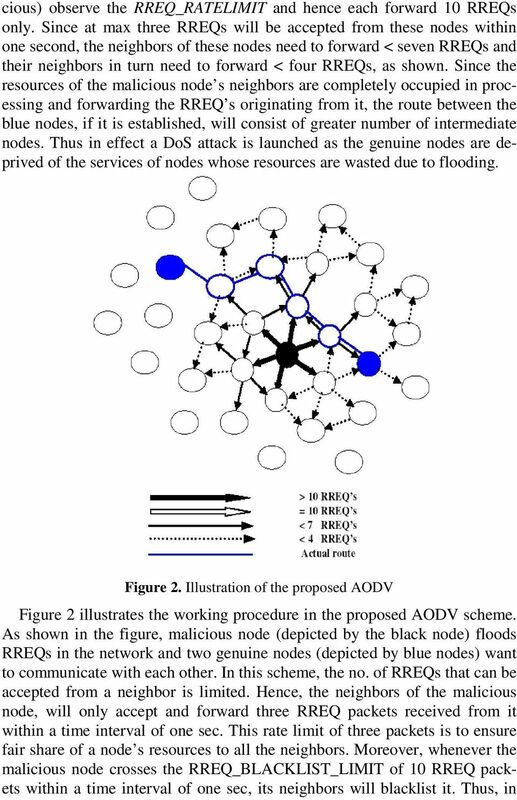 Performance of proposed AODV protocol in presence of compromised nodes. 7 Each simulation was carried out for 17.2 seconds. The results for both cases have been observed. The following section gives the parameters that were measured for both the original and the modified protocols Network Simulation Metrics The metrics are the important determinants of network performance, which have been used to compare the performance of the proposed scheme in the network with the performance of the original protocol. This study has been done to show that the proposed scheme enhances the security of the routing protocol without causing substantial degradation in network performance. 1) End-to-End Delay: Average time difference (in seconds) between the time of the packet receipt at the destination node, and the packet sending time at the source node. 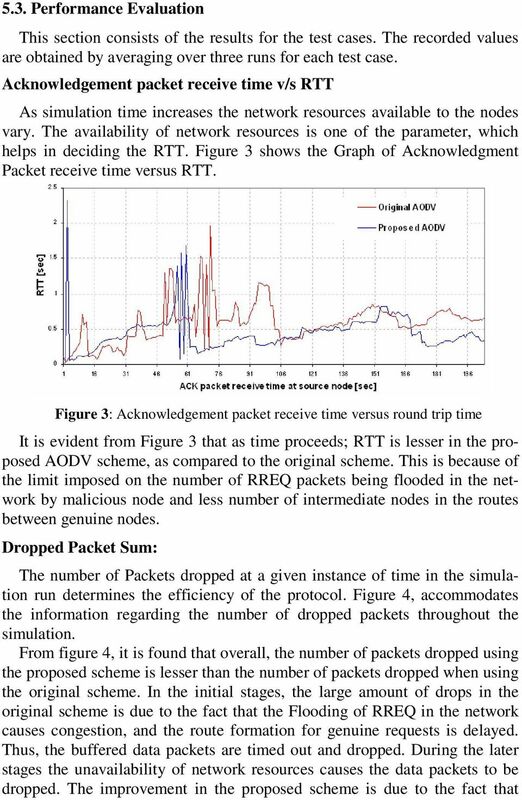 2) Round Trip Time (RTT): Time difference between the receipt of the acknowledgement from the destination node to the source node, and the time of sending of the original packet at the source node. 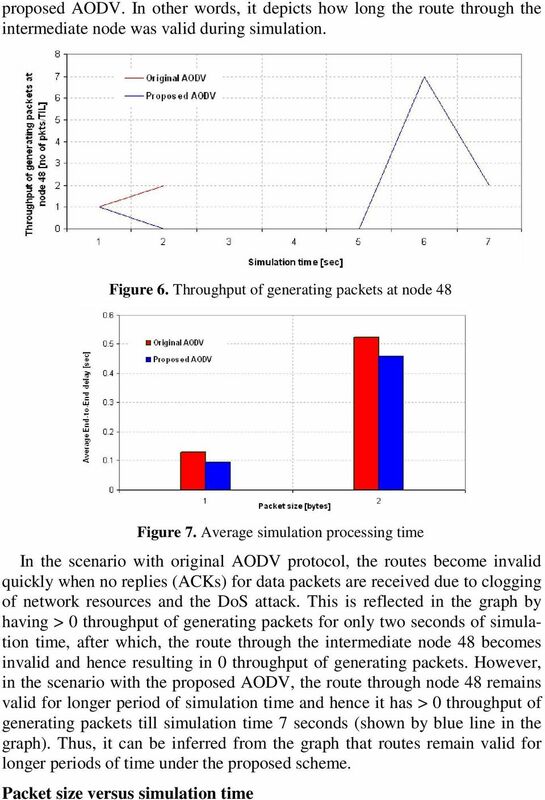 3) Average simulation processing time at nodes for a packet: Time difference between the packet forwarding time and the packet receipt time at a given node. 4) Average number of nodes receiving packets: Sum of numbers of all the intermediate nodes (nodes between source and destination nodes) receiving packets sent by all the source nodes / number of received packets at all the destination nodes. 5) Average number of nodes forwarding packets: Sum of numbers of all the intermediate nodes (nodes between source and destination nodes) forwarding packets sent by all the source nodes / number of received packets at all the destination nodes. 6) Delays between current and other node: Shows end-to-end delays (in seconds) between current node (sender) and other node (receiver) 7) Number of data packets dropped: The number of data packets dropped at any given node. This is an important parameter because if the number of dropped packets increases, the throughput would decrease. 8) Throughput: It is sum of sizes (bits), or number (packets) of generated/sent/forwarded/received packets, calculated at every time interval and divided by its length. Throughput (bits) is shown in bits. Throughput (packets) shows numbers of packets in every time interval. Time interval length is equal to one second by default. 11 The comparison of simulation processing times as illustrated in Figure 6 reveals that the proposed scheme incurs no additional overhead as compared to the original scheme. Table 2. 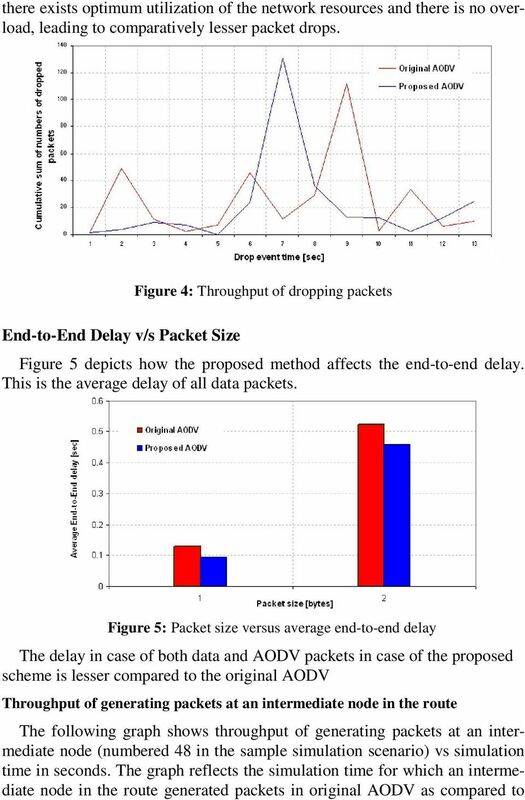 Overall network simulation results Original AODV Proposed AODV Average End-to-end delay [sec] Receiving packets Forwarding packets Average RTT Network information for sample scenario Table 2 gives the comparative study of network information for original AODV and proposed AODV. 6. 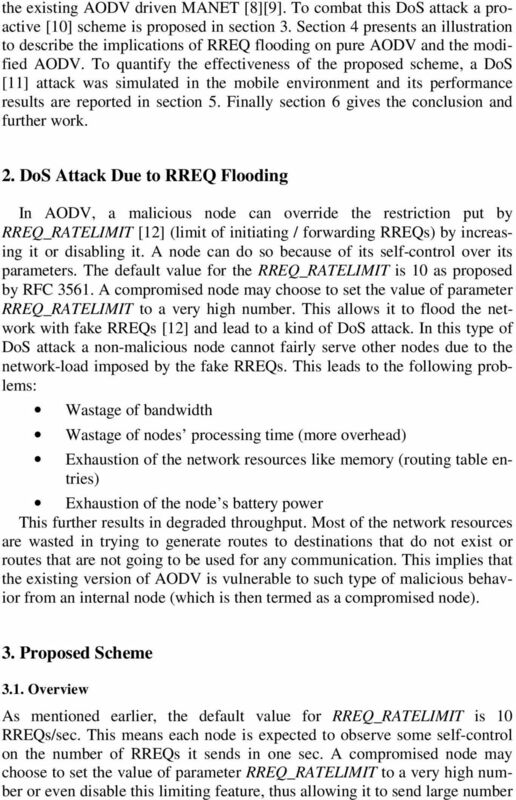 Conclusions and Future Work The DoS attack caused due to RREQ flooding in ad hoc network can be successfully detected in the proposed scheme. The scheme can accurately detect the malicious nodes in the network. The malicious nodes identified are blacklisted and none of the genuine nodes in the network are wrongly accused of misbehaving. 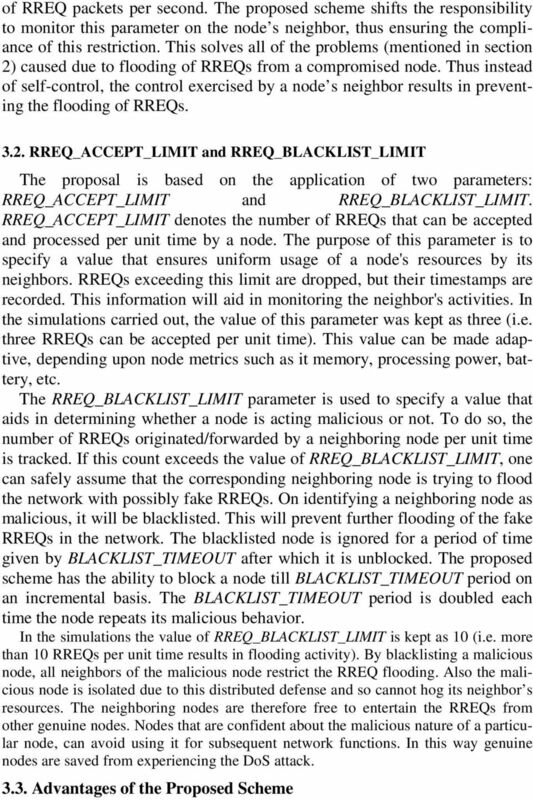 In the proposed scheme, there is an enhancement in the performance of the network in presence of compromised nodes. Mobile computing and communication is an upcoming field, which is capturing the imagination of all the researchers worldwide. Thus the scope of enhancements and improvements is enormous. An immediate enhancement can be making the limit-parameters adaptive in nature. This can be done by making calculations based on parameters like memory, processing capability, battery power, and average number of requests per second in the network and so on. Further, the protocol can be made secure against other types of possible DoS attacks that threaten it. 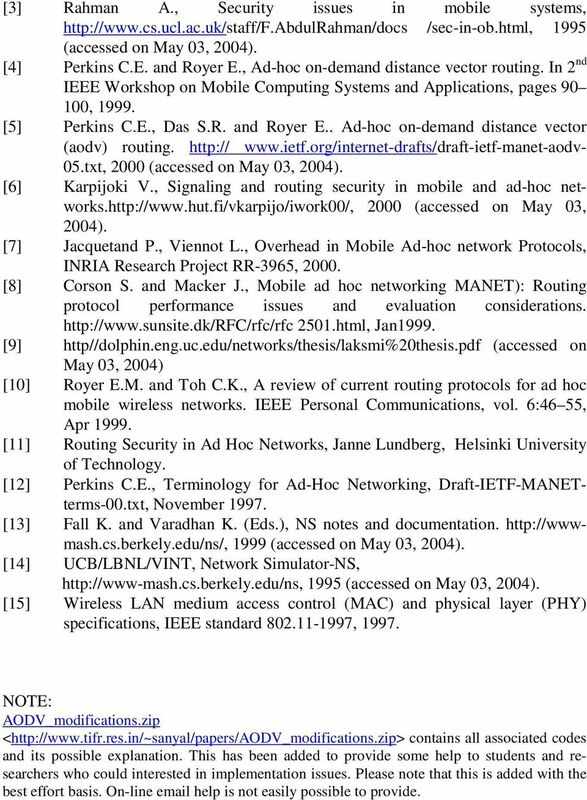 References  Perkins C.E., Royer E.M., Das S.R., Ad hoc On- Demand Distance Vector (AODV) Routing.draft-ietf-manet-aodv-08.txt, March  Broch J., Maltz D.A., Johnson D.B., Hu Y.C., and Jetcheva J., A performance comparison of multi-hop wireless ad hoc network routing protocols. In 4th International Conference on Mobile Computing and Networking (ACM MOBICOM 98), pages 85 97, Oct 1998. 12  Rahman A., Security issues in mobile systems, /sec-in-ob.html, 1995 (accessed on May 03, 2004). Perkins C.E. and Royer E., Ad-hoc on-demand distance vector routing. In 2 nd IEEE Workshop on Mobile Computing Systems and Applications, pages ,  Perkins C.E., Das S.R. and Royer E.. Ad-hoc on-demand distance vector (aodv) routing txt, 2000 (accessed on May 03, 2004). Karpijoki V., Signaling and routing security in mobile and ad-hoc networks (accessed on May 03, 2004). Jacquetand P., Viennot L., Overhead in Mobile Ad-hoc network Protocols, INRIA Research Project RR-3965,  Corson S. and Macker J., Mobile ad hoc networking MANET): Routing protocol performance issues and evaluation considerations html, Jan1999. 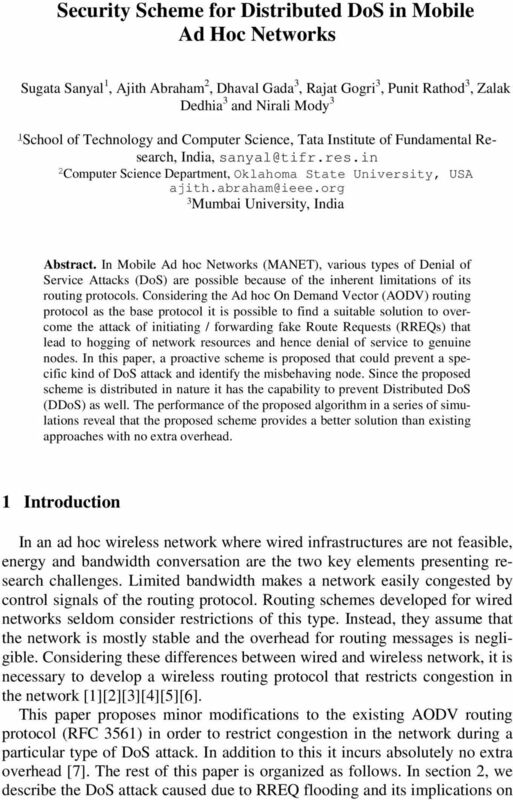 http//dolphin.eng.uc.edu/networks/thesis/laksmi%20thesis.pdf (accessed on May 03, 2004)  Royer E.M. and Toh C.K., A review of current routing protocols for ad hoc mobile wireless networks. IEEE Personal Communications, vol. 6:46 55, Apr  Routing Security in Ad Hoc Networks, Janne Lundberg, Helsinki University of Technology. Perkins C.E., Terminology for Ad-Hoc Networking, Draft-IETF-MANETterms-00.txt, November  Fall K. and Varadhan K. (Eds. ), NS notes and documentation (accessed on May 03, 2004). UCB/LBNL/VINT, Network Simulator-NS, (accessed on May 03, 2004). Wireless LAN medium access control (MAC) and physical layer (PHY) specifications, IEEE standard , NOTE: AODV_modifications.zip < contains all associated codes and its possible explanation. This has been added to provide some help to students and researchers who could interested in implementation issues. Please note that this is added with the best effort basis. On-line help is not easily possible to provide. Formal Measure of the Effect of MANET size over the Performance of Various Routing Protocols Er. Pooja Kamboj Research Scholar, CSE Department Guru Nanak Dev Engineering College, Ludhiana (Punjab) Er. CHAPTER 6 VOICE COMMUNICATION OVER HYBRID MANETs Multimedia real-time session services such as voice and videoconferencing with Quality of Service support is challenging task on Mobile Ad hoc Network (MANETs). Keywords DDoS, security attacks, Packet delivery ratio, Wireless mobile adhoc network, defense mechanisms. Natarajan Meghanathan Assistant Professor of Computer Science Jackson State University Jackson, MS 39217, USA nmeghanathan@jsums. 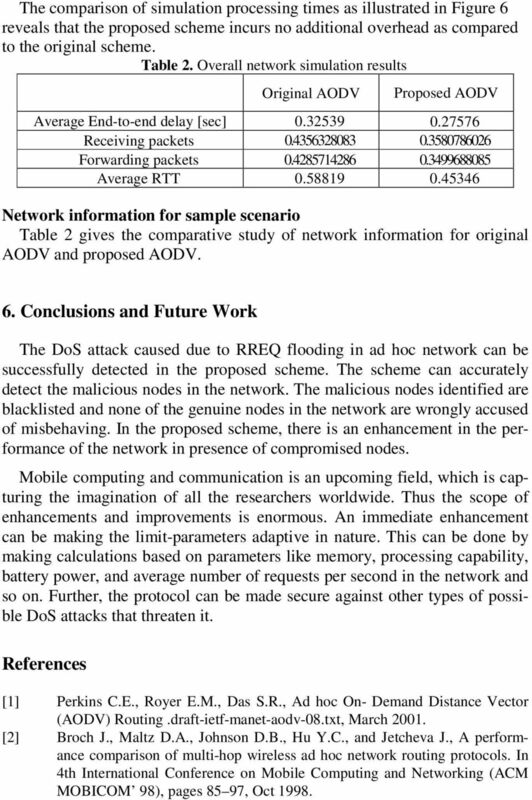 Performance Comparison of Two On-demand Routing Protocols for Ad Hoc Networks Samir R. Das Division of Computer Science The University of Texas at San Antonio San Antonio, TX 7849-667 U.S.A. Charles E.